130 million families In Sub Saharan Africa do not have access to electricity, limiting their chances of achieving economic prosperity and improved quality of life. Energise Africa aims to provide clean and renewable energy to 111,000 rural homes in Sub-Saharan Africa, currently without access to electricity. Julliette Nabukenya lives in Mpigi in rural Uganda. She works at the Home of Hope and Dreams - a home that looks after children that have been abandoned by their families. The home has been using a solar system for three years and Julliette has witnessed first hand the vital impact that it's had on the lives of the children living there. The 25 children who live at the home are home schooled. Solar power has provided clean and reliable light for the children. It also provides a great source of light after dark, allowing the children to increase their study time. Many of the children have medical needs that needed to be catered for. Prior to getting solar power, the electricity would regularly go off, threatening to ruin the children's medicines stored in the refrigerator. Since having solar power installed the electricity is constant 24/7 and all the medicines are able to be properly refrigerated. Not having to deal with the electricity outages has meant that the team at the Home of Hope and Dreams have had more time to dedicate to caring for the children and running the home. Since the home had solar energy installed they have saved 50% on the cost of electricity. Previously the home used to pay 200,000 Ugandan Shillings a week for their electricity, but with the addition of solar this has now fallen to 100,000 Ugandan Shillings. Energise Africa aims to ensure access to affordable, reliable and sustainable energy in areas where it is most needed. Falling costs of solar technology has created a new set of pioneering businesses working on installing life-changing solar systems in homes in Sub - Saharan Africa. With your investment, we will work to provide 111,000 homes in rural areas with clean and affordable energy, providing a platform for supporting the achievement of affordable energy for all by 2030. Azuri has combined solar and mobile technology to allow customers to access power on a PayGo basis, providing affordable, clean and safe renewable energy for as little as half the cost of the fossil fuels being replaced. As a pioneed of PayGo solar power when it first entered the Kenyan market in 2012, Azuri has since expanded its reach to 12 African countries, and has sold over 100,000 systems to date, which are expected to impact more than half a million people. 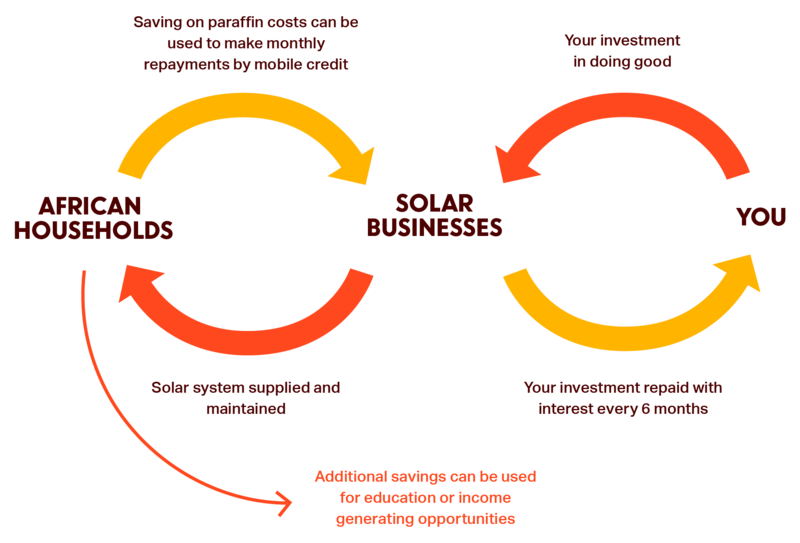 SolarNow makes solar energy accessible and affordable to millions of off-grid people in Africa by taking a large scale and systematic approach. To date, they have sold over 16,000 systems to 9,500 households since 2011. An investment in this campaign will help SolarNow to provide clean energy to a further 500 households and businesses in Uganda.